This morning, whilst I was drinking coffee and eating Malteser slice, I was browsing the Internet looking for facts about books, which sounds rather sad, but it keeps me entertained for hours. Because I had noticed one of his books on my shelf last night, I thought I would read a little about Magnus Mills, who is one of my all-time favourite writers. My search began with some disappointment. Many of his books seem to have generated some fairly negative reviews. On Amazon one person said that if the system allowed it they would give one of his books a minus score, which is rather mean. 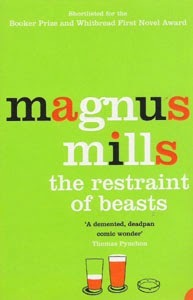 Magnus' books definitely divide opinion, and I have lent them to friends in the past to a very mixed reception. Some people love them, some are confused and indifferent. Personally, I really enjoy the dark humour and understated comedy. In The Restraint of Beasts, a story about high-tensile fence builders of all things, there is a constant sense that something terrible is about to happen. In All Quiet on the Orient Express you fear for the narrator's sanity and well-being as a series of seemingly simple incidents extend his camping trip in the Lake District with increasing absurdity. These stories have a real deadpan quality to them and a underlying darkness that I always enjoy. Also, to his credit, Magnus Mills still drives buses in London even after his publishing success. I love the idea of a famous writer driving passengers down Oxford Circus, the majority of them completely oblivious as to who's behind the wheel.